Planetary Resources video lays out the venture's asteroid-mining plan. The venture known as Planetary Resources eventually plans to go asteroid mining — but the first step in the billionaire-backed business plan is to launch an orbital fleet of "personal space telescopes" capable of looking out into the heavens or back down on Earth. Right now, the idea of sending robotic drilling operations to near-Earth asteroids, extracting water for powering interplanetary spaceships — and, by the way, turning that into a profitable business — sounds like pure science fiction. But to quote Planetary Resources' president and chief engineer, Chris Lewicki: "Everything is science fiction right up to the point that it's science fact." Lewicki knows his way around an outer-space challenge. He's been involved in managing NASA's twin Mars rover missions as well as the Phoenix Mars Lander mission, which made the first on-the-spot observations of Red Planet water ice. Even by that scale, however, his new mission at Planetary Resources is special. It's not just a once-in-a-lifetime opportunity. "Maybe once in a species, that kind of opportunity comes along," he told me. The venture, which was hinted at last week and formally unveiled Tuesday at Seattle's Museum of Flight, is sufficiently down to Earth to attract funding from such A-list investors as Google CEO Larry Page, Google executive chairman Eric Schmidt, Texas billionaire Ross Perot Jr. and spacefaring software executive Charles Simonyi. Filmmaker James Cameron has signed on as a senior adviser. Planetary Resources is the latest brainchild of Eric Anderson, whose company Space Adventures has helped millionaires and billionaires go on 10-day trips to the International Space Station; and Peter Diamandis, the motive force behind the multimillion-dollar X Prize program, the Rocket Racing League and the Zero G Corp.'s weightless-airplane tourist venture. Anderson and Diamandis serve as co-chairmen of the venture they co-founded. Diamandis said Planetary Resources follows up on discussions that he and Anderson had starting about three years ago — and also follows up on a nearly lifelong ambition he's had. "As a teenager, when I was asked what I wanted to be, I'd say, 'An asteroid miner,'" Diamandis told me. Planetary Resources' ultimate goal is to set up a commercial infrastructure for fueling trips far beyond Earth orbit, with Planetary Resources controlling the equivalent of oil wells, refineries and filling stations in outer space. That's the long-term promise of near-Earth asteroids. 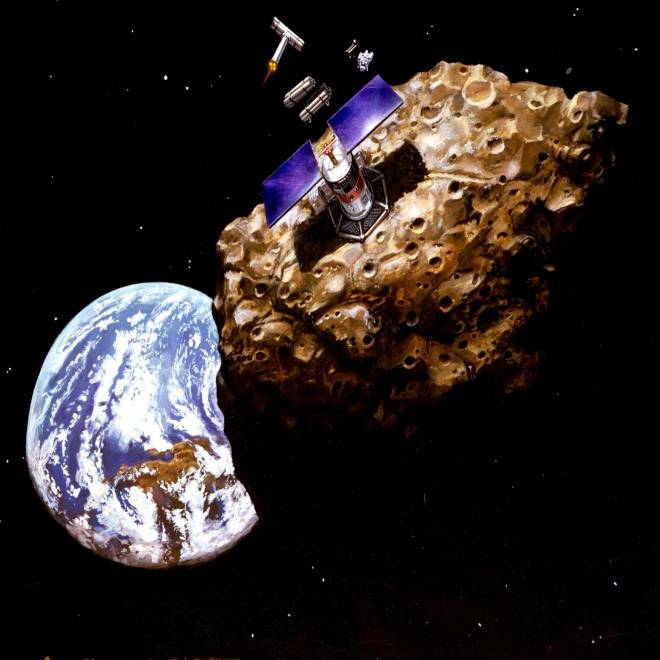 An artist's conception shows a robotic mining operation on a near-Earth asteroid. "A water-rich asteroid would greatly enhance the large-scale exploration of the solar system," Anderson said in a news release. "Water has many uses in space. For instance, it would not only be used for hydration, but also would be broken down into oxygen and hydrogen, for breathable air and rocket propellant." But why go to all the trouble, when there's so much water on Earth? "It costs on the order of $20,000 per kilogram to get a liter of water into orbit," Diamandis explained. "If you're able to buy it on orbit for one-hundredth of the cost, that would be transformative." Asteroids also could yield precious metals such as platinum, gold and rare-earth materials — treasures that are worth bringing back to Earth. Diamandis said a single asteroid in the range of 200 to 500 meters in diameter could contain more platinum-group metals than has ever been mined in the whole of human history. "When the availability of these materials increases, the cost will reduce on everything, including defibrillators, hand-held devices, TV and computer monitors, catalysts; and with the abundance of these metals we'll be able to use them in mass production, like in automotive fuel cells," Diamandis said in the news release. Humbler materials could be used for construction of deep-space facilities. "Even dirt is valuable as a radiation-shielding material," said former NASA astronaut Tom Jones, who got his Ph.D. in planetary sciences by researching remote-sensing techniques for asteroids. Jones is now serving as an adviser to the Planetary Resources team. First launch in two years? Building a commercial empire in outer space may be the long-range plan, but the short-term plan is closer to home. The first step to mining an asteroid is figuring out what's out there. To that end, Planetary Resources' first hardware project is what's known as the Arkyd-101 personal space telescope. Planetary Resources has developed the Arkyd-101 space telescope with remote sensing capability, as shown in this artist's conception. Data gathered from near-Earth asteroids will assist in analyzing the composition of the body to determine a commercial value. Lewicki hopes the personal space telescope will do for astronomy what the personal computer did for information technology. Planetary Resources plans to put the instrument into Earth orbit to survey the sky for potential targets — asteroids that come close enough to Earth often enough to make them reachable, and have a spectral signal that would make them good candidates for mining. The main target is C-type or carbonaceous asteroids, which are dark and not so easy to detect with existing instruments. The Arkyd-101 telescope is designed to be launched on any of a variety of rockets, including the Russian Dnepr, the European Ariane, the Indian PSLV or the SpaceX Falcon, Lewicki said. It would have arcsecond resolution for astronomical observations, and if the camera were turned earthward, Lewicki said the resolution would be a "couple of meters per pixel," which comes close to the standard for commercial Earth imaging. The key factor is the cost: Lewicki noted that an imaging instrument like NASA's Wide-field Infrared Survey Explorer would typically cost hundreds of millions of dollars. "We're looking to go one to two orders of magnitude below that," he said. Diamandis said that price reduction would significantly widen the market for orbiting telescopes. "We're in discussions with groups that might want to buy personal telescopes," he told me. Another part of the Planetary Resources' early-phase business plan would be to strike a deal with NASA, under which the space agency would buy data about the spacecraft and astronomical observations. NASA may find such data useful for planning its own missions to near-Earth asteroids, culminating in manned flights in the 2020s. Similar data purchase deals were made a couple of years ago with several of the companies that are planning to put landers on the moon to win a share of the $30 million Google Lunar X Prize. Thanks in part to technology development contracts with NASA and other partners, "the company is cash-flow positive at this point," Diamandis said. He said about 20 engineers have already been hired to work for Planetary Resources, with operations based in Bellevue, Wash., east of Seattle. The need to advertise for more employees was one of the reasons why the company's principals decided it was time to go public with their plans, Diamandis said. He and Lewicki are projecting the first launch of hardware in the 18- to 24-month time frame. Once the telescopes are up and running, the team will identify likely candidates for future missions. The top targets would be near-Earth asteroids that are energetically easier to reach than landing on the moon. Getting to those asteroids would require the development of additional spacecraft for the Arkyd product line, such as an in-space propulsion vehicle and an experimental resource-extraction package. "Three, four, five years out, depending on trajectory, is when we envision getting up close and personal with an asteroid," Lewicki said. Planetary Resources says space mining could "add trillions of dollars to the global GDP," but such an estimate assumes that there'll be a significant demand for the water, fuel and air produced in outer space. If NASA doesn't send out deep-space transports, or goes with a space propulsion system that doesn't require a periodic fill-up, that could reduce the projected demand for the materials that Planetary Resources aims to produce. That doesn't faze Lewicki, however. Even if NASA doesn't turn into a buyer, "we've got a private interest in developing those resources," he said. There's also a question about the part of the operation that would involve shipping platinum and other materials back to Earth. Platinum now costs more than $1,500 an ounce, but with current technology, the cost of launching a mining probe, extracting ore, processing the metal and returning it to Earth would almost certainly be more than that on a per-ounce basis. "The question is, how does the economics come into this?" said Adam Bruckner, a professor of aeronautics and astronautics at the University of Washington. "Can it ultimately be less expensive to find it on an asteroid than to find it on Earth? At some point in the future — and it's debatable how far in the future — the two lines will cross." Anderson acknowledged in a video statement that Planetary Resources would be an unconventional, long-term venture: "On a scale of 20 to 30 years, I envision the resources from space contributing a significant amount to the GDP of the planet — truly creating a world where one plus one equals three." Bruckner noted that the idea of mining asteroids for water and other resources has been around for decades. Fourteen years ago, for example, a company called SpaceDev planned to take on a commercial deep-space mission to an asteroid. SpaceDev eventually abandoned the idea and turned its attention instead to the development of small satellites and hybrid rocket engines. In 2008, the company was acquired by Sierra Nevada Corp., which is currently receiving millions of dollars from NASA for spaceship development. Bob Richards, co-founder and CEO of Moon Express Inc., one of the ventures competing for the Google Lunar X Prize, said he welcomed Planetary Resources' efforts but insisted that the moon was a better target for resource extraction than any near-Earth asteroid. Just today, Moon Express announced that it sent NASA a mission plan that eventually could lead to mining missions on the moon. "I looked at this myself," Richards told me. "The energy argument doesn't trump the fact that we've sampled the moon and we know what's there. ... But it's a big universe. There are trillions of trillions of dollars in space resources, so there's enough room for a lot of players." Could legal loophole lead to extraterrestrial land claims? This report was last updated at 3:40 p.m. ET.